If you are experiencing any degree of mold in your home, you need to address it quickly. The sooner it’s treated, the smaller the chance of it spreading out of control. Mold only needs a small amount of moisture to thrive and spread throughout your home. It takes hold quickly, and it is always better to be proactive and get rid of it as soon as possible. If you need the services of a mold remediation specialist, look for one that not only eradicates the mold, but eliminates the source. While you want the mold out of your home, just cleaning it up is only one step. You need to identify what is causing the mold, and remove or fix it. Mold can damage your property and your health. If you need to remove mold quickly, contact a Cranford mold remediation company for immediate relief and to prevent further spreading. Mold usually takes hold because of excessive moisture. One of the most likely places to check for mold growth in your home is the attic. Obviously you cannot check the roof of your house every day, but tiny roof leaks can allow moisture to seep in. Closed, unvented attic spaces that are now filling with moisture provide the perfect conditions for mold to grow. Perform regular attic checks for drips, leaks or dark spots on the ceilings and walls, obvious indicators of unwanted moisture. Make sure ridge and soffit vents are not blocked, and that attic fans are circulating air. Another place that can have the perfect conditions for mold to grow is the basement. Often, basement windows and doors remain unopened all year round, creating an environment of stale air. If there are cracks in the masonry, moisture can find its way in. Heavy rain and snow travel along basement walls, with the potential to seep into these cracks, making the basement damp. Gutters clogged with leaves and debris no longer pull water away from the foundation wall. This causes rushing water to pool along the basement exterior. Water in the basement is an invitation for mold to grow. While attics and basements are good places to look for visual signs of mold growth, it can appear anywhere. Not all signs are visual, however. Stale, musty odors can also be an indication of mold growth. Bathrooms are especially prone to mold, for obvious reasons. Poor ventilation can lead to mold growth, so make sure vents are clean and working, or open windows regularly. Mold can even spread rapidly in tight closet spaces. Make sure to leave room for air to flow in these areas, so air them out frequently. If an odor makes you suspect mold, call a professional. Not all mold is black, but this type of mold is obviously the easiest to spot. If you see mold taking hold anywhere in your home, you need to call a professional. Also, remember, stale, musty smells can also indicate an excess of moisture. It does not take much for mold to colonize. Air out basements, attics and closet spaces frequently to get rid of stale, damp air. Do not overfill closets, or stack too much stuff in the basement or attic. Even with the best preventative measures, however, mold can still spread in your home. If mold is growing your home, you need to take care of it, and the source. Don’t just look for a quick fix. 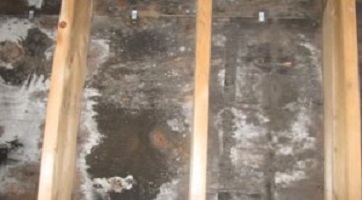 Look for a Cranford mold remediation company that will fix the problem and its cause.